There is no certainty whether Alor, a one-man project of a Spaniard Mikael Black (a strange name for a Spaniard too), will continue from here, but Haerfest was one cool, relaxing, dark neo-folk record which, when they come at the right time and mood, can hit a spot. Something fitting to appear on Prophecy Records, Haerfest is reserved, introspective and quite meditative experience. The clarity of Alor sound is like spring brook water flowing through melting snow (Lundensgaturnar), and is representative of many dark atmospheric acts, most noticeably Agalloch circa The Mantle, Empyrium and recently discovered Dammerfarben. Yet to be fair, not every moment of Haerfest is centered on acoustic strum providing steady rhythm and keyboards flowing over the top to provide melodies. In fact, the overreliance on the strumming acoustic guitar stagnates melodic progressions and doesn't allow tracks like Monanleoht to reach their apogee. However, when the opener While the Fall Paints These Woods in Red, the start to Nacken and the closer … There Are Eyes into the Dusk add full-bodied distorted guitars to fill up the canvas Alor paints, the confluence of the acoustic cold withdrawnness and more assertive guitars provides for some of the best compositional moments on Haerfest. The acoustic weave of Wooden Whispers, both sad and medieval, does make for the complete story, and it is almost unfortunate we have to wait for a couple of better compositions, like Wooden Whispers and … There Are Eyes into the Dusk, all the way to the end. Only a pair of pieces on Haerfest are truly instrumental, but the lyrics are mostly quiet whispers. Thus, with this album the pictures conjured by the music will be limited only by your imagination, which is not an exception for this style. After thunder and rain barge into the serenity and coldness of While the Fall Paints These Woods in Red mid-way through, the nature seems to have sprung to life, euphoria expressed thereafter reaching Alcestian proportions without resorting to Alcestian tremolo needing to express it. Partially incomplete melodic etude When at Night the Shadows Rise … combines Swiss tubes from the Ricola commercial and the sounds of old castle hidden up in the mountains. Alor's kaleidoscope is not spinning fast at all, allowing for a certain image to set in, so your mind can gaze at it for quite some time. 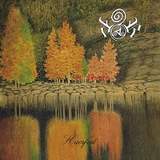 Haerfest is a nice album to experience at the edge of seasons, when you are not certain whether to rejoice for spring's arrival or ready to go into hibernation when fall is almost over. This is not the music for those who need their folk to be built on obvious melodies or anybody with the desire to have at least something rocking for the 40+ min duration Haerfest lasts.